Back in 2007, it was Michelle Goodman’s The Anti 9-to-5 Guide that got me up and running as a full-time freelancer. Later on, I read My So-Called Freelance Life (also by Goodman) and wished I’d had it from the very beginning. 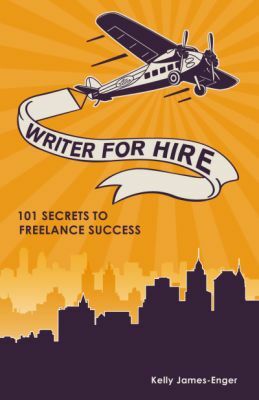 Last week, I speed-read Kelly James-Enger’s Writer for Hire: 101 Secrets to Freelance Success and realized it was the book I should have had when the economy — and my business — first hit the skids. Luckily, no matter how long you’ve been freelancing, there’s always something to learn. I’ve been reading Kelly’s blog — Dollars and Deadlines — for awhile now, and also recommend her book on ghostwriting and coauthoring — Goodbye Byline, Hello Big Bucks — to just about every writer I come into contact with. So I was thrilled when I heard she had written a new book. In fact, I devoured the entire thing in two days, dog-earing pages on market research, story ideas, reprints, and contract templates. What struck me the most, however, was that Kelly had created a level of success that allowed her to bring in a full-time income while working part-time hours. Basically, my idea of perfection. After the jump, Kelly is generous enough to share how you can do the same. 1. You mention in the intro to Writer for Hire that you quit a career you hated, about 15 years ago, to go full-time freelance. How did you prepare for this transition? Or was it more spur-of-the-moment? I prepared financially but that was about it. Once I sold my first two articles in 1996 (one to Cosmopolitan and one to Brides), I started saving money and paying down expenses so I could eventually quit law. By the end of the year, I had six months’ worth of expenses saved (I was living with my now-husband, which meant my expenses were pretty low) and was ready to make the leap. What I didn’t do (and what I should have done) was work on developing my business during that time, reading about freelancing, etc. I didn’t do much of that until I went full-time on January 1, 1997. 2. I love that you’ve created a career that allows you to make a full-time income with part-time hours. Many beginning freelancers work harder instead of smarter, and end up chained to their laptops on nights and weekends. How long did it take you to get to this point, and what was the turning point for you? I do think you’re going to spend a lot more time working at the beginning of your career, because you have to market yourself aggressively before you start getting work/assignments. I definitely was putting in 40-50 hours a week at first — probably more if you count all the time I was spending reading magazines, looking for potential markets, reading about freelancing, etc. Once I started specializing in health, fitness, and nutrition, and was writing for some of the same markets (like Woman’s Day, Family Circle, Fitness, and Fit) more than once, I could spend less time marketing/researching. That was at about 18 months into my career. 3. What are your top tips for working smarter, rather than harder? Number one, focus on building relationships. I did a lot of “one-shot” stories early on, meaning I wrote about one particular subject for one particular client/editor, one time. Now I only pitch markets I can write for more than once. Second, try to write about every subject more than once. I specialize, so I’m not always recreating the wheel. So when I wrote a story about the popularity of flavored teas for a trade magazine (a story that was assigned to me), I also wound up pitching and writing articles about caffeine addiction and its dangers and enhancing sports performance with caffeine for two other markets. Third, prioritize. Save your most productive time for your most demanding work, which for me is writing (as opposed to interviewing or researching or editing). 4. As someone who has diversified pretty damn successfully, which type of work has proven to be your biggest moneymaker? In contrast, which type of work do you enjoy the most? What has been your most fun/interesting/unusual/gratifying project? My biggest moneymaker right now is the ghostwriting/coauthoring I do. I get decent money upfront to do a book or book proposal and, with some of my projects, I get “back end” money as well (typically a percentage of royalties) if the book earns out. I actually really enjoy writing service articles and books (fortunate since that’s how I built my career! ), but I also enjoy writing fiction, too. My most gratifying projects have been the first two “chick lit” novels I wrote in the early 2000s, and my new novel (“hen lit,” as opposed to “chick lit”), The Honesty Index. If I could make a full-time living just writing fiction — with a few how-to articles here and there for variety — I’d love to do that. 5. The subhed for your book is 101 Secrets to Freelance Success. I’ve been thinking a lot about success lately, and about how the definition can vary from person to person. What is your personal definition of success? The answer to that question had changed for me over the years. At first, I think I defined success as being able to replace the income I would have made as an attorney with freelance income. Then it was hitting the six-figure mark as a freelancer. Today, I’d say it’s being able to make a decent living in part-time hours so I have time to spend with my kids (who are almost 7 and 2 and a half), and to be able to remain self-employed in an ever-changing environment. I think eventually I’d like to get to the point where I have enough passive income coming in (through royalties, ebook sales, whatever) that I can write only what I want to write, not what clients pay me to write. That day is still a ways off, though!